These little green gems inhabit large areas along the south east coast of North America. They are found in woods and scrub areas, especially near streams and ponds. They frequently can be heard calling throughout the summer months. Life Span - 2 to 5 years in captivity. There are four main species of tree frog which vary in size from just a few to more than 10 centimetres in length. The European tree frog is found in meadows and shrublands across eastern Europe but is considered endangered in western Europe. The Common tree frog is the smallest of the tree frog species and is found in a variety of habitats across south-east Asia. The Cuban tree frog is the largest of the four tree frog species ans is natively found in Cuba and its surrounding islands, but has been introduced to parts of Florida, the Caribbean and Hawaii. The Red-Eyed tree frog is the most distinctive of the tree frog species and is native to the jungles of Central America. The Red-Eyed tree frog has a long narrow body and hind legs which point outwards, along with its characteristic red eyes. Because these frogs are small and easily frightened, they often do not do well with frequent handling. Some specimens do seem to tolerate occasional handling, however, so handling frequency should be determined on an individual basis. The little frogs tend to be nocturnal, and in captivity they will be the most active once the lights are off. Males frequently call most of the year, especially after being misted in the tank. Since your frog is native to a semi-tropical climate it will obviously need a semi-tropical setup. You will want to start with the enclosure itself. Glass aquariums work the best not only because they are easy to clean but they make for good visibility inside. You will want to use nothing less than a 10 gallon. 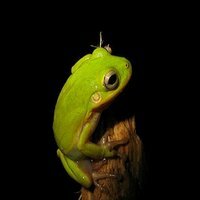 Since this is a tree frog, an enclosure that is taller than it is longer would work the best. A screen top is also required for security reasons and good ventilation. 1 or 2 Green Tree Frogs can be comfortably housed in a 10 gallon tank, or a 12 x 12 x 18 glass terrarium. Of course, bigger is always better, especially if you want to keep more than 2 frogs in your cage. These frogs enjoy high humidity, and a substrate that allows plenty of water to evaporate throughout the day should be used. This can be orchid bark, cypress mulch, jungle bedding, or coconut husk bedding. In addition to a bedding that can hold moisture, humidity can be increased with sphagnum moss, which will also add to the aesthetic appeal of your terrarium. Furnishings in the cage should allow the frog to hide during the day, as well as provide surface area for water to land when the cage is misted. The more foliage in the cage, the happier the frog will be, so make sure your cage looks like a lush tropical paradise! Use of live plants, fake vines, jungle vines, tropical plants, or even magnetically attached jungle plants will help your frogs feel much more at home. In addition to foliage, branches, caves, cork flats, and cork rounds can provide additional hiding places for the frogs. As for cage furniture, you can use driftwood, cork bark, sticks and branches (warning: anything you collect from the outside must first be soaked in a mild bleach and water solution overnight, then soaked in water for another night and allowed to thoroughly air dry to kill any bacteria or bugs that may harm your frogs. Be sure the items are not releasing any fumes when they are placed into the enclosure). You will also need some kind of foliage. You can use fake or live plants, but unless you are setting up a very large and elaborate setup, fake are the best as live plants are hard to keep alive indoors, unless you are planning on using air plants. Those work well, but make sure you don't let them dry out (avoid keeping these plants under or over heat sources). Green Tree Frogs live entirely off of insects in captivity, and will readily consume appropriate sized crickets. Some frogs will even eat small roaches! All insects fed to your frogs should be gut loaded with a high quality cricket gutload, and immediately prior to be fed, they should be dusted in a high quality reptile calcium supplement at every feeding. About once a week, insects should be dusted in a high quality reptile multivitamin. Males are usually smaller than females and have yellow to greenish-yellow throats. Upon reaching sexual maturity at approximately 1 year of age, males will begin to call. The call starts out quietly ad quickly builds to a constant WOK!, WOK!, WOK! that lasts for 10 to 20 seconds. Females have creamy white throats and will only make a short brief response call to a male or a distress call when annoyed by being handled or another frog sitting on them. Hailing from the US, Green Tree Frogs do not need exceptionally hot temperatures to thrive in captivity. A simple day bulb should be sufficient to create a warm area in the cage that reaches the high 80s. At night, drops into the low 70s are acceptable, and if your cage is getting too cool, a night bulb will help keep temperatures comfortable for the frogs. In addition to heat, UVB lighting can be very beneficial to the longevity of your Green Tree Frogs. Use of a compact fluorescent will light up your cage, help your plants grow, and also help your frogs correctly metabolize nutrients in their diet. Your frogs are insectivores and will take small insects that they can easily fit in their mouths. I find crickets to be the best because they are readily available and are easy to breed on your own. Whatever the food, make sure the insects have a day in their own enclosure to get some food. T-Rex sells a cricket food for gut-loading that I use and find to be very inexpensive and good. The food contains extra calcium so the frogs will benefit from the nutrient rich gut of the insects. You will also want to coat the food with calcium and multi-vitamin supplements about 3 times a week. The frogs also need to be misted once a day with de-chlorinated water. Do all spraying in the morning to prevent any bacterial buildup. You should thoroughly clean the enclosure once a week. This involves taking every thing out and rinsing and scrubbing it under hot water(no soap). You may want to place the frogs in a small container at this time. The tank itself will need to be cleaned too (hot water, no soap). As for the carpeting, this you can wash with laundry detergent but it must be rinsed well with cold clean water. You may find it useful to have two pieces of carpet so when one is dirty you will always have a clean one ready to go in. United States of America -Southeastern U.S.A.